Three candidates hopped on a Zamboni machine at the National Sports Center in Blaine last week, asking for votes in a video they posted to Facebook. What are they running for? Seats on their electric cooperative's board of directors. If they win, they'll have the chance to help govern the direction the co-op will take in a future, which many think will be fossil fuel-free, or nearly so. "This is about eight people who make huge decisions," Brad Blue, one of the three people on the Zamboni, said in an interview this week. "It really matters." This isn't the first time Blue has run for a seat on the Connexus Energy board. He lost a run in 2016. But the team approach this year is new. Blue, James Nelson and Marsha Van Denburgh are each running to represent different districts in Connexus' coverage area, and say they are promoting more co-op transparency and member engagement and want to integrate new technology that maintains reliability and affordability. Energy advocacy groups are watching the race closely because Connexus is Minnesota's largest electric co-op with 133,000 members, and is seen as a leader in the transition toward new, cleaner technology. In addition to videos on Facebook, the three board candidates have shown up together at events, and their faces appear on a campaign flyer mailed out to residents and businesses in the Connexus service territory, which covers parts of seven counties in the northern Twin Cities suburbs. The real battle, Van Denburgh said, is getting people to vote at all — less than 10 percent of members voted in the last Connexus board election. Van Denburgh, a small business owner and former St. Francis school board member, said she wasn't even aware of how electric cooperatives worked until last year. On the campaign trail, she's found she's not alone and is repeatedly reminding people not to throw away their ballots. "I want people to vote, and of course, I'm hoping they vote for me. I'm hoping I can be a good listener and represent them, but really for me, it's about being a participant in this process," she said. Van Denburgh is running against Shelly Peterson, also a relative newcomer to electric co-op governing. She applied for a vacancy on the board last fall and has served since then. 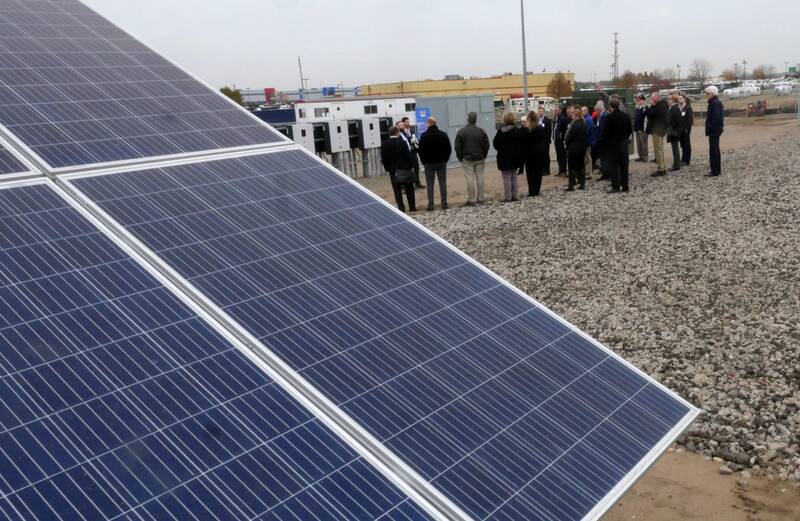 It's an exciting time for Connexus, she said, noting the co-op has been working on a strategic plan and unveiled a unique solar-plus-storage project in October. "Electricity and the idea of taking it a step beyond using my hybrid or my little Nest thermostat and seeing what I can do that can make a difference for the next generation is where I want to be," Peterson said. "Co-ops have the opportunity to do some cutting-edge things that the Xcel Energys of the world aren't even doing." About a third of Minnesota residents get their electricity through one of the state's more than three dozen electric cooperatives. Unlike an investor-owned utility such as Xcel Energy, Minnesota Power and Otter Tail Power, co-ops are owned by their members. Each co-op is a member of a larger generation and transmission cooperative like Great River Energy, Dairyland Power and Minnkota Power. The larger co-ops own power plants and get additional power from wind or hydroelectricity contracts. They also buy electricity from the grid as needed. Minnesota requires 25 percent of electricity provided to Minnesota customers to come from renewable sources by 2025, and some are pushing the Legislature to increase the mandate to 100 percent clean energy by 2050. • 100 percent carborn-free energy: Is it possible? Xcel Energy is planning a quicker transition away from fossil fuels than any other Minnesota utility, helped in part by its two nuclear plants. The company announced a plan late last year to provide 100 percent carbon-free energy by 2050 and expects to be about 60 percent carbon-free by 2022. Great River Energy has committed to 50 percent renewable energy by 2030. How fast to transition away from fossil fuels is a question all Minnesota utilities face. Blue said it's part of the reason why he, Nelson and Van Denburgh teamed up to run. "I think it's incumbent on our co-op to meet people where they are. It's not just about LED bulbs," he said, adding that much bigger questions are at stake for co-ops — like what to do about long-term contracts for coal-fired electricity and how to use electric vehicles to keep electricity demand in check. The three candidates are getting support from an environmental group, CURE, that's pushing for co-ops to be more transparent and more aggressive about embracing renewable energy. Erik Hatlestad, the group's energy democracy organizer, said Connexus is already leading on solar and battery storage. "We'd really like to see a future where Connexus can also be a leader in the democratic engagement of membership," he said. Blue attended his first board meeting a few years ago and said he had to call ahead to attend. "I showed up and there were two of us. Two people," he said. Blue praised Connexus for putting information about board candidates on its website but said the board could be doing a lot more to get members involved. He said some of the board members have been there a long time, including two of them up for re-election this year. One of them, Ken Fiereck, who has served for 15 years, defended the board's accomplishments and said Connexus does well on customer satisfaction surveys. "I think we're doing a fantastic job of serving our members," Fiereck said. Of the three board challengers, he said, "I really don't know what more they can offer." Connexus members will find out who will represent them after votes are tallied at the co-op's annual meeting on April 10. Electric cooperatives throughout the state are holding their annual meetings this spring. The events are open to the co-op's members (those who get electricity through the co-op) and typically include free food, entertainment and an opportunity to vote for fellow members to represent them on the co-op's board of directors. • East Central Energy, April 11, Superior, Wis.